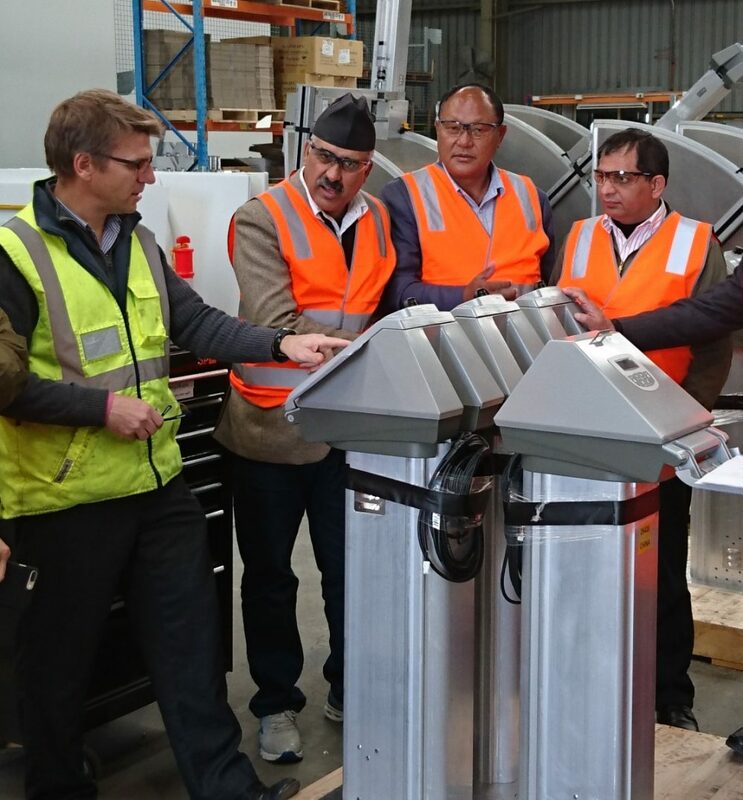 Nepalese Parliamentary Delegation visit Australia to share experience of reform, policy and practice. Water is a significant natural resource for Nepal and is abundant throughout the country in the form of snow cover, rivers, springs, lakes and groundwater. So, it’s not surprising that all levels of their government recognise its importance and were keen, under a Development Cooperation agreement with Australia, to send a Parliamentary Delegation to Australia to share experience of reform, policy and practice . From September 9 to 16, ICE WaRM hosted the Nepalese visit led by the Minister for Energy, Hon Mahendra Bahadur Shahi, and including the Chair and Members of the parliamentary Agriculture and Water Committee as well as the Secretary and Joint Secretary of the Water and Energy Commission Secretariat. Following a briefing in Adelaide on water management, irrigation and agricultural policies and practices by the Hon Ian Hunter, South Australian Minister for Water and Senior State Government officials, hosted by former Chair of the National Water Commission, the Hon Karlene Maywald, the group flew to Loxton on the Murray River. Here they heard from senior irrigation and agricultural research staff from the Loxton Research Centre and were particularly interested in the operation of community owned irrigation infrastructure as well as water trading. The group was also interested in the use of root stock and budding to develop fruit trees with root systems able to cope with various hostile soil properties such as salinity but had highly productive canopy systems. They were then taken to Banrock Station to see how adopting wetting and drying management practices had improved the environment over the last twenty years and visited a citrus orchard and vineyard. Here they observed some of the most efficient irrigation systems in the world including the use of covered crops. Impressed by the farm operations, the group were keen to develop an exchange program to bring producers from Australia to Nepal to establish and operate demonstration properties as well as send leading farmers from Nepal to learn Australian practices. In Shepparton, the group were briefed by Goulburn-Murray Water on their operations where it was noted that the length of the canal system they operated was over five times the length of Nepal from east to west (approx. 1000 km). The group then inspected the local canal systems and visited Rbicon to view the construction of the regulator gates and operating system. The Nepalese Government has a vision to establish over 1m hectares of new irrigation and the Minister, impressed with the Rubicon system, will consider Rubicon in the planning and design of this new irrigation scheme. To end the week, the delegation, the Ambassador and Honorary Consul for New South Wales, met with the Managing Director of Entura who provided a brief on the operation of the hydro system in Tasmania and its role in the national electricity market and Minister Shahi was extremely impressed with the scope of operation. Ms Maywald and Specialist Advisor, Andrew Johnson from ICE WaRM, facilitated a closing workshop on lessons from Australia’s experience that could benefit Nepal’s journey. Minister Shahi was extremely pleased with this visit and indicated that it was held at an important time in the context of Nepal’s development goals given their recent adoption of a new Constitution and recognised the importance of conducting extensive research before implementing policy. The visit has progressed a positive relationship between Nepal and Australia and the Nepalese Ambassador has planned to meet with the Australian Minister for Foreign Affairs to seek further collaboration on water and irrigation, agriculture development and energy policy, hydro development and electricity markets.